The Young Scientist is always fun and unlike last year I entered as individual, this time in the Chemical, Physical and Mathematical Sciences category. My project was called "Extensions to Conway's Game of Life using Biomimetic Algorithms to produce Practical Uses". All the code, along with my project report book is in available here. 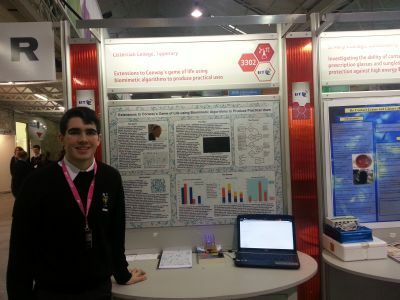 The aim of this project is to research practical applications of the cellular automation, Conway's Game of Life. To do this, biomimetic algorithms are also used. An effort was made to extend Dr. Stephen Wolfram's pseudorandom number generation by way of one-dimensional cellular automation, into two dimensions. The output of this new two-dimensional pseudo random number generator is then compared to one pseudo random number generator and one true random number generator. The issues surrounding the performance of the generator are also addressed. This project is purely proof of concept that this method can be applied practically. It is hardly practical to do so however,because much more efficient and comprehensive generators are available.